Growing up, I was a kid that I’m sure most parents would love to have at the dining table with them. You know, the type of kid, who would scowl at the sight of everything green, leafy, or remotely bland? I was certainly NEVER one of them. Quite the opposite in fact. I was quite a trooper, guzzling down whatever was handed to me. I ate whatever was on my plate, vegetables included. I would even ask for second helpings of those bean sprouts, or long beans fried with chye-poh (salted radish), hae bee (dried shrimps) and chopped chillies (one of my favourite vegetable dish). My extended family knows how much I love my vegetables. My grannie would deliberately give me extra portions of whatever greens she had cooked whenever I came over for dinner. Aunts would beckon me to have more of whatever vegetable dish they had cooked up. There also seemed to be no vegetable that I did not like (with the exception of bitter gourd, but I have since learnt to like it, especially when it is cooked with black Chinese vinegar and served cold). You can actually serve me just vegetables at dinner and I will not bat an eye-lid. I would probably be grateful instead, and smile at you while chomping down that beautiful mesclun salad dressed lightly with balsamic vinegar and olive oil dressing (simple but perfect) with sun-dried tomatoes. Heck, I’m not averse to munching on raw Japanese cucumbers either. Refreshingly crunchy, it tastes good on its own, plus I love the clean feel. 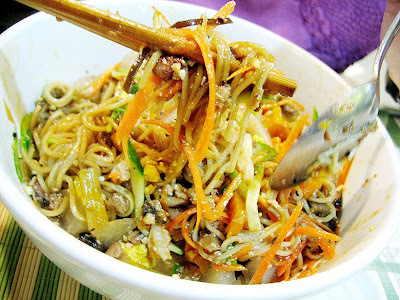 • Flexitarianism – Mostly avoiding all meat, but eating it under some situations. • Mafism – Mammalian meat is excluded, but fish, seafood and poultry are not. • Pollotarianism – Mammalian meat, fish, and seafood is excluded, but chicken or other poultry is not. • Pescetarianism – Mammalian meat and poultry is excluded, but fish and seafood are not. I know what Pescetarianism is, I know a friend who is one. But Mafism and Pollotarianism? I’ve never heard of those. Fine then, I thought. I just won’t call myself a semi-vegetarian. Besides, I don’t have to be vegetarian to love vegetables anyway. I’ll have my greens with meat and be happy at the same time, thank you very much. But the story doesn’t end here. Eager to try out what it would be like to be a vegetarian, I set out to do what most normal people (like my meat-loving friends and colleagues) would baulk at; I went in search of vegetarian places that would convert me, and perhaps impress me so much I would never want to put my lips near any piece of meat, mammalian or not. I didn’t have to go far to find this first vegetarian place that I’m going to tell you about today. My workplace is situated near a Buddhist and a Hindu temple and most of them are vegetarians, so there would naturally be plenty of vegetarian eateries around. I was right. Case in point: Fortune Centre. This unassuming beige building is apparently a vegetarian/organic/health food institution. Naturally, it was the first place I went to, to begin on my vegetarianism ‘pilgrimage’ of sorts. Note that I have tried vegetarian food before, but they were mostly either oily, or filled with plenty of gluten that I eventually gave up on them. So my story begins with a random visit to Fortune Centre, with a friend who had given up meat for lent. She asked me if I knew of any vegetarian place and I instinctively pointed her to Fortune Centre. Then she said, “Why don’t you come along?” and I did. I’m also very glad I did, because it brought me to a lovely vegetarian, organic eatery that I have grown to love. I’ve only visited New Green Pasture Café five times, but I have to say that each visit has been most pleasant. I’ve not quite tried their entire menu, but I would sure love to, slowly but surely. On their name card, it says “We specialise in organic food, vegetables, fruits, wheatgrass, brown rice, sea salt, miso, nuts & seeds and vegetarian products. Our products are ogranically grown, free from chemical fertilizers and chemical pesticides.” They also write that their food is msg-free, and low in fat and salt. It sure doesn’t sound very appetising. Let me assure you however, that it’s not bad, at all. The owner, Sophia Teh, is a sprightly lady who champions not only vegetarianism but organic produce. The café also doubles up as a supermarket of sorts, selling everything from organic vegetables to quinoa (including quinoa noodles! ), Bonsoy (my current absolute favourite soy milk), mixed grains, almond butter, etc. Sophia was there on my fifth visit when I brought along my mum. She was having her dinner when we entered the café and after greeting us warmly, she smiled and asked what we would like to have. I saw that she was having some noodles and I asked her what it was. “Zha jiang mian”, she replied. 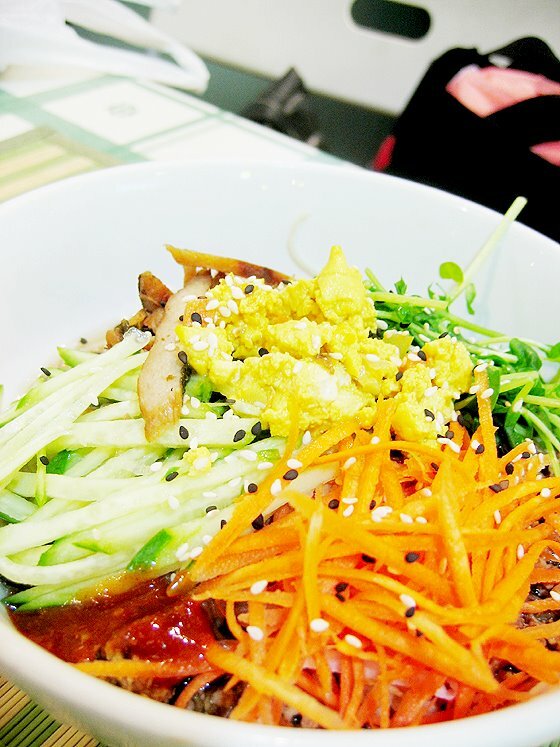 Okay, I love zha jiang mian and I can never say no to a bowl, whether it be vegetarian or not. I was also curious, so I ordered that, along with their signature soba salad (I’ve had that about two times prior to this visit and I knew it was really good. More on that later), and the seaweed roll. I had brought my mum here because she too was curious about the place, after listening to me rave about it like the time I raved about Big D’s Grill. No doubt they might not be on the same playing field (come on, one serves unbelievably good kurobuta pork and wagyu beef), but I had to convince her that I wasn’t bluffing, that this was as good, in a healthy sort of way. My mum hates cooking but she loves to eat. Ever so often, when I get into my obsessive ‘(insert eatery’s name)’s food is so good, you have to try it!’ phases which also translates into having every single person I meet knowing about said place because of how much I rave about it, it will in turn get my mum really curious. She would then ask me to bring her there. And so I did, and thankfully, she liked it. So back to the food, yes the very healthy, very green, very ‘feel-good’ food. 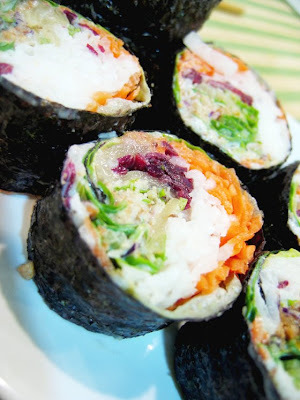 Their seaweed roll is one of my favourites. The first time I tried it, I thought that it was something I wouldn’t mind eating every single day. 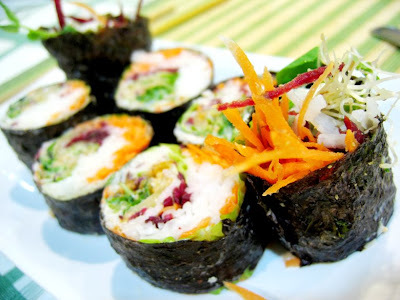 The roll was simply a combination of various raw vegetables, lightly dressed with a refreshingly sweet yet tangy sauce. I’m not quite sure what they used, but I’ll be sure to ask the next time round. I believe that they used the same sweet and tangy sauce for the soba salad because they tasted the same. 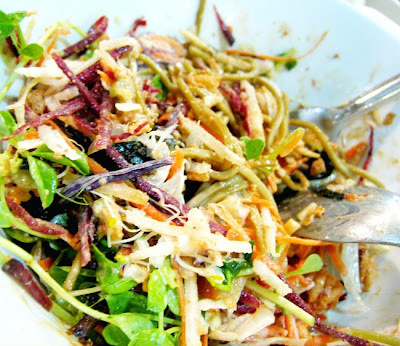 There were plenty of greens in the salad, everything from shredded beetroot, dou miao, and carrots, to purple cabbage. You can refer to the photo and try to guess what was what. The broken pieces of brown rice crackers added plenty of crunch, which I enjoyed too. 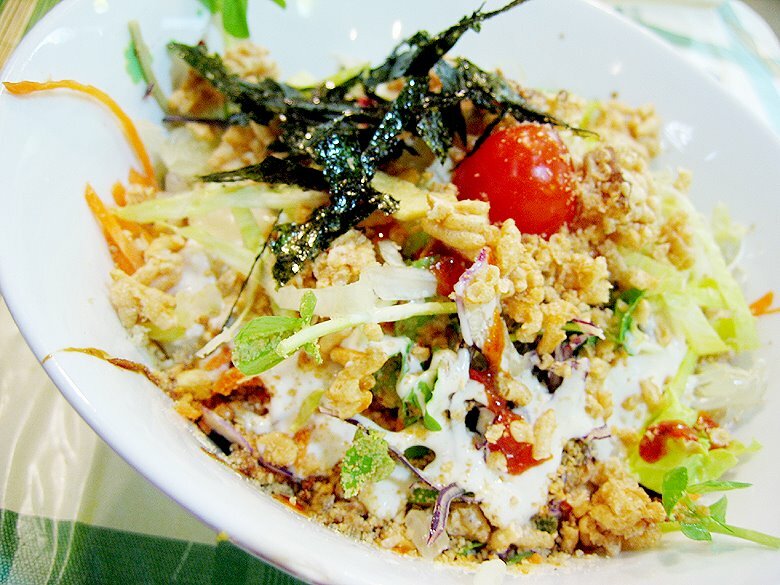 New Green Pasture Café’s zha jiang mian obviously can’t be compared to the original version with minced pork. Theirs came packed with plenty of greens (yay) and their meat substitutes were made from tofu I believe. Again, very healthy and very satisfying. The portion was huge but we finished it anyway. They probably used brown rice or quinoa noodles because we didn’t feel the bloat that usually comes after you finish an entire bowl of noodles. Dessert was black sesame paste and coral jelly. The black sesame they used is ground in-house and they blend it with soy milk. It was also not very sweet, in fact, my mum said it could have been sweeter. Well I thought it was fine the way they served it. Coral jelly came with soy milk (Bonsoy, I believe) and attap chee (fruit of the palm tree). There are no photos for these two desserts because I was too eager to dive in. If you ever think that going vegetarian means giving up on tasty food then you have to think again, or maybe visit New Green Pasture Cafe yourself. They might not serve meat but they sure know how to satisfy both the palates of vegetarians and non-vegetarians alike. I think that their offerings are surprisingly tasty. It is truly possible, with the right ingredients, to cook up a delicious meal that is not only good for you, but meat-free and msg-free. Other menu items I have tried and like are their nasi briyani, penang laksa and brown rice set. They also have daily specials. All you have to do is ask. The more I think about it, the more it seems possible. Me, becoming a vegetarian. It’s not like I have never thought about it. I have! However, I’m always faced with sceptical looks from friends and family who would laugh loudly and ask me why would I ever want to do that? I don’t know actually. Perhaps because I love vegetables? I know that’s not the issue. It is also about sparing the animals the torture. However, I’m a fervent believer of the natural progression of the universal food chain. I’m on the verge of sounding evil, but hey, I won’t deny that I enjoy meat as much as I enjoy my vegetables. Maybe one day, when I am able to convince myself that it is absolutely horrendous to eat meat,(don’t know when that will be but well, just presenting a scenario), then I will become a full-fledged vegetarian. Until then, I will continue to practise my own version of semi-vegetarianism, or what my sister calls, ‘omnivorism*’. * By the way, I checked and yes there is apparently such a word.